As it is my last day of Easter leave, I have been chilling out and doing a lot of reading. This one article in the Melbourne newspaper The Age got me thinking. It is titled “Stuck in our cars on the highway to hell“. It describes the nightmare that is the transportation headache around Melbourne. Building new freeway tunnels and bypasses are not going to solve the problem. Our public transport system has not had a major upgrade for many years, and even India is upgrading their metro rail system. This means that the expanding western suburbs of the city, which have grown considerably in size over the last 10 years, cannot cope with the increasing amount of cars on the road. I will give you an example. When I first moved to Melton West in August 2000, it would take me 45 minutes to get to South Yarra by car, which is some 51 km. This was with me leaving at 0630 in the morning. If I drove to the Central Business district today, which is only 42 km from Melton West, it would take between 70 -120 minutes if I left at 0630. This is craziness, because if I did not have a Hybrid, I would be idling longer in traffic jams and stop/start driving is not very fuel efficient. When I do drive my Hybrid, I can’t help to think about everyone else who’s car/trucks do not turn off when idle, or don’t use electric only mode when crawling along at 20-40 kph. All those emissions make me sick! So what are the alternatives? Public transport in my area is a joke, but because of my painful bonus, I am forced to use it (I can’t sit down for very long). We have a bus stop about 10 minutes walk from my house, and many times I have been standing, waiting for a ride to the railway station and it doesn’t turn up. The buses have a frequency of about 30 minutes during peak and hourly off peak. Then when I do get to the train station, the platform is jammed packed with people, and a two carriage train turns up! Talk about sardines in a tin. The train system out west is a joke. We have a single track, that is not electrified, and serviced by slow old diesel locomotives made in the 70’s. There are some new fast trains, but the carrying capacity is nothing like what is required. I know trains are more efficient at transporting the same number of people compared to cars, but I am sure these old loco’s need a tune up, you should see the smoke when they start moving! The train frequency is every 30 minutes peak and every 60 – 90 minutes off peak. The similar journey that I take by car takes me 75 minutes by public transport and walking part of the way. One very positive thing I will say for the Melbourne public transport system is the single ticketing system and the fares are very reasonable. An all day ticket from my area to the city of Melbourne is only A$10.20, and you can travel on any bus, tram, and train all day. Packed like sardines, but all day travel. This country is addicted to automobiles and building freeways to solve the current issues. Our current climate change targets will never get met if we continue in this manner. Even if everyone changed to Hybrids, it would still not solve the problem for too long. In a few years, the volume of traffic would have increased further, negating the efficiencies of the new technology. The only solution I can think of is to beef up the public transport system, and to start making Electric Vehicles or Plug-in Hybrids, that have been charged by renewable energy, and do it very, very quickly. As in most citys, the urban sprawl is increasing every year, so the transportation and emission problems will only get worse, unless we act quickly. I am no expert on this subject, but I can see what is going on around me, and it is not pretty. Another solution would be to decentralise the Central Business District. Take the business and industry out to the suburbs so that workers are local and not spread across the entire city. Just a thought, it might work. With modern communication as it is today, there shouldn’t be any problems, except for the companies ego’s worrying about the stigma attached to being located in certain suburbs. They will have to get over it! With this solution, car travel is reduced as most people could ride bikes! How fit would everyone then be? Obesity in this country would be a thing of the past, decreasing the strain on the public health system. The road toll would reduce, because a head on collision between bikes would not be a tenth as bad as two cars hitting each other (and easier to avoid). The air would be cleaner, and we would be well on our way to meeting any emissions targets that are likely to be set in Kyoto II. When Peak Oil does does happen, if it hasn’t already, and global oil supply starts to decline rapidly, we would not free fall into a spiralling economic depression (maybe) because of transport issues. The railways would be freed up to transport more goods instead of using massive diesel powered trucks. Just like the good old days. Well, I have had my rant for the week, and hopefully got you thinking about the transportation options of the future. As I said, I am no expert on these matters, but it doesn’t take a rocket scientist to figure all this stuff out! I have been promising to plant out the fallow garden bed for a while, so today I put up a 2 metre trellis for the Sweet pea. I found the trellis behind our little shed, which was still in good condition, and hammered in two garden stakes for support then fixed the trellis with cable ties. It fits nicely at the end of the bed against the brick wall. I sowed about 15 seeds, and they should germinate in about 14 days. I will be able to train the plants up the trellis for a large bloom of colour. I then planted Nasturtiums in half the bed, and will plant the rest out with red poppy in a couple of months time. Lots of colour, as winter vegetable gardens don’t have much, so it will brighten up the place. Kim is now very happy. After lunch, Adam and I made a batch of beer. We used Coopers Canadian Blonde as the base mix and added 1 kg of Brew Enhancer #1 to it. We completed the first part inside, which was to mix the ingredients with 2 litres of boiling water, and then Adam carried the fermenter out to the rainwater tank and we filled to 23 litres. Adam then carried the heavy fermenter to the shed, and we finished of mixing and took the initial specific gravity measurement (1.045), then pitched the yeast. 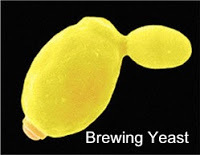 I then philosophised with Adam and I proposed that yeast were kind of like our current civilisation. Let me enlighten you. Yeast multiply when there is an abundant and reliable food source (sucrose) and ideal living conditions (water temp between 21-28 degree C). They then produce waste that they can’t dispose of (ethanol). If their water gets to hot, they die or too cold, they die (micro climate change). They then multiply rapidly until their food source runs out, and eventually their waste poisons their environment. Most of them die and fall to the bottom of the barrel! Sounds familiar, doesn’t it. I can certainly relate to the analogy and so did Adam. The real question is, will we be like yeast, or will we stop being like yeast and change our behaviours and create a new way of living sustainably? I vote for living in a sustainable way, as I don’t want to end up like the yeast in my beer fermenter, which is at the bottom of the barrel! One hundred thousand islands with weirdo relatives and hippy dressed sheep. With dogs wearing thongs with moles on their bums. Sounds like a David Bowie song in the making! We actually kept on going past 9pm because we were having so much fun, and then Adam told Ben that it was 9.15pm and it was all over. How very hard it is for today’s generation to live without electricity. Adam was having PC withdrawal symptoms about 45 minutes into the event. 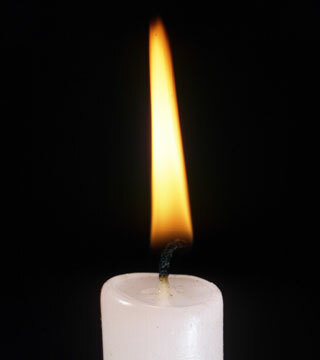 So blow the candles out and another Earth Hour is over. Luckily we practice energy efficiency anyway and have a very low footprint on the earth. For our family, Earth Hour was just another excuse to light some more candles and have fun. Something we normally do on a Saturday night anyway! It was interesting to have a look out on our street and see that most of the lights were off in the houses. It looks like about 60% of our neighbours participated (or maybe they were out for the night), however the orange glow coming from the east was still ever present, signalling that most of the street lights in Melbourne were still lit. Baby steps, Gavin, baby steps (take a deep breath). Maybe next year they will have the courage to turn off the street lights!